What are the signs and symptoms of a broken foot? What are the signs and symptoms of a broken foot in an infant or toddler? How many bones are in the foot (pictures)? What are the causes of a broken foot? What is the healing time for a broken foot? How can I tell if I have a broken bone in my foot? What can you do for a broken foot (treatment)? What are the complications of a broken foot? Is it possible to prevent a broken foot? When should I call the doctor for foot pain? 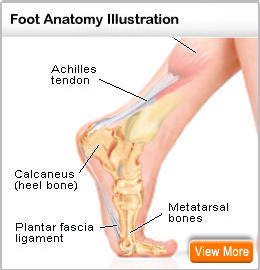 The bones in the foot may be broken in many ways including direct blows, crush injuries, falls and overuse or stress. Signs and symptoms of a broken foot may include pain, limping, swelling, bruising, and refusal to bear weight on the affected foot. Initial treatment may include RICE (rest, ice, compression, elevation). Rest may include the use of crutches to limit weight bearing. X-rays often help make the diagnosis but bone scan or computerized tomography (CT scan) may be needed to help visualize the injury. Treatment of foot fractures depend upon which bone is broken but many fractures are treated with a compression dressing, a stiff-soled shoe, boot, and weight bearing as tolerated. Some foot fractures require surgery to repair the damage. Complications of foot fractures include non-union at the fracture site, arthritis if a joint is involved, and infection if the skin is broken. Healing and recovery time for a broken foot depends upon the type of fracture and the bone(s) involved. Joint dislocation: If the bones are significantly displaced (the bone alignment has been lost or there is an associated joint dislocation) a deformity of the foot may be apparent. People with existing diseases or conditions: with altered pain sensation due to peripheral neuropathy (persons with diabetes are a classic example), pain may not be present, and the fracture may be missed initially. This also may occur in persons with spinal cord injuries. Bruising, swelling, and deformity may be the only clues to a potential fracture. Infants and toddlers may ignore the pain of their injured foot when they see a health-care professional. They may refuse to bear weight on their leg. The child may sit comfortably on the parent's lap without complaint until asked or made to stand. The foot is designed to withstand the considerable forces placed on it by walking, running, and jumping. There are 26 bones of the foot, connected by joints and supported by thickened ligaments to absorb the impact of movement. As well, the joints of the foot are acted upon by muscles and tendons that allow flexing and extending to permit walking and running to occur. The hindfoot consists of the talus that forms the base of the ankle joint where it meets the tibia (shin bone) and the calcaneous or heel bone. Ligaments from both the talus and the heel bone span the ankle joint and attach to the tibia and fibula (the other shin bone) to provide stability. The midfoot consists of the navicular, the cuboid, and the three cuneiform bones. The midfoot is where inversion and supination of the foot occurs. These motions allow the sole of the foot to turn inwards and upwards. In the forefoot, the five metatarsal bones are connected to each toe. The toe bones are called phalanges (single = phalanx) with the big toe having two and the other four toes having three each. These bones are named based upon their relationship to the body: proximal, middle and distal. Proximal means closest to the center of the body while distal is furthest from the center. The toenails are located over the digital phalanges. The arch of the foot is maintained by the plantar fascia, a thick fibrous band of tissue that runs from the calcaneus to the metatarsal bones, preventing the bones of the foot from flattening. There are places in the foot where two bones meet to form a joint. Each joint has its own set of structures that help maintain stability. Injuries to the foot include fractures of the bone, sprains of the ligaments that stabilize the joints, and strains of the muscles and tendons that move the foot. Joints can also become inflamed (arthritis). Arthritis can be acute (short-term) or chronic (long-term). A fracture, break, and crack all mean the same thing when it comes to a bone injury: the integrity of the bone has been damaged. The cause of injury may be obvious, such as jumping from a height or a heavy object falling and landing on the foot, or it may develop gradually over time, such as the result of the constant stress of walking or running. Foot fractures account for 10% of all the broken bones in the body, and the mechanism of injury usually can give a clue as to what bone might be injured. Fractures of the calcaneus (heel bone) usually occur when a person jumps or falls from a height, landing directly on their feet. The force of the landing may also be transmitted up the body to cause fractures of the ankle, knee, hip, and lumbar spine. Injuries to the midfoot, the metatarsals, and phalanges often are caused by a direct blow sustained when a kick goes awry or from a crush injury when a heavy object is dropped on the foot. Twisting injuries can cause bones to break. 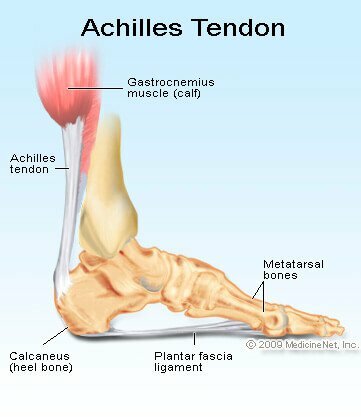 For example, fractures of the base of the fifth metatarsal occur when the ankle rolls inward and a fragment of the bone is pulled off (avulsed) by the peroneus tendon. The most common causes of an injured foot include falls; crush injuries (including impacts from a heavy object or an automobile accident) missed steps, and stress/overuse injuries. Recovery and healing time for a broken foot depends upon the type of fracture and the bones broken. A broken foot is diagnosed by the health-care practitioner taking a history of how the injury occurred. The mechanism of injury will give clues as to what type of injury may exist and importantly, what other associated injuries may also be potentially present. It is helpful to know how much time has passed from when the injury occurred to when the patient presents for care. Past medical history is important; those with diabetes or other conditions that suppress the immune system are at greater risk for infection with foot injuries. Inspection of the foot for swelling, bruising, deformities and open wounds. An exam of the circulatory system, feeling for pulses, and assessing how quickly blood returns to the tip of a toe after it is pressed and the toe turns white (capillary refill). Motor function, asking the patient to move the injured area. This assists in assessing muscle and tendon function. The ability to move the foot means only that the muscles and tendons work, and does not guarantee bone integrity or stability. The concept that "it can't be broken because I can move it" is not correct. A range of motion exam of the foot may be helpful in assessing ligament stability. However, if the fracture is obvious, the health care practitioner may choose to keep the foot immobilized to prevent further pain. X-rays are often taken to evaluate the status of the bones in the foot and to check for fracture. Usually three views are taken to help the health care professional and radiologist adequately view the bones. Special views may be taken if there is concern for a fracture of the calcaneus. X-rays may not be taken for simple toe injuries, since the result may not affect the treatment plan. For some foot fractures, X-rays may not be adequate to visualize the injury. This is often true for metatarsal stress fractures, where bone scans may be used if the history and physical examination suggest a potential stress fracture, but the plain X-rays are normal. Computerized tomography (CT) may be used to assess fractures of the calcaneus and talus, since it may better be able to illustrate the anatomy of the ankle and midfoot joint and potential associated injuries. Magnetic resonance imaging (MRI) may be used in some cases of foot fractures. 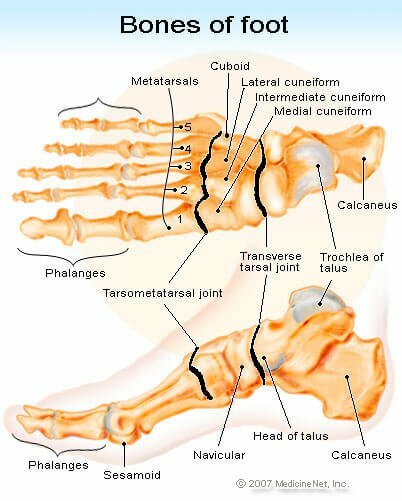 The Lisfranc joint describes the connection between the first, second, and third metatarsals and the three cuneiform bones. A Lisfranc fracture dislocation often requires a CT scan to evaluate this region of the foot. While X-rays may hint at the damage in this type of injury, the CT can delineate the numerous bones and joints that may be damaged. First aid at home may include RICE (rest, ice, elevation, and compression). Rest may include the use of crutches to limit weight bearing as tolerated. If the decision is made to seek medical care, this regimen may be continued once the patient is discharged from the hospital to go home. The treatment of a foot fracture depends upon what bone is broken, the mechanism of injury, the underlying medical condition of the patient, and whether the fracture is open (the skin is broken) or closed (the skin is intact). Broken toes are often treated symptomatically, with the injured toe "buddy taped" to an adjacent normal toe. It may be helpful to place cotton balls or other absorbent material between the toes to prevent dampness and skin injury. A stiff-soled shoe and crutches may be needed to help with walking. Healing should occur within 4 to 6 weeks. Fractures of the great toe that are displaced may require surgery to allow better healing. An orthopedic surgeon or podiatrist (foot specialist) may choose this option, but often that decision is made electively a few days after the injury. Open fractures of the toe usually require good wound cleansing to prevent infection. At the same time the health care practitioner will often explore the wound, looking for foreign objects and evaluate the condition of deep structures like tendons, looking for lacerations. Metatarsal fractures often heal nicely with conservative care, meaning no operation is needed. The foot is wrapped for comfort to decrease swelling and placed in an orthopedic post-op or Reese shoe. Cast boots also may be considered. First metatarsal fractures that are aligned nicely may be treated with a post-op shoe with no weight bearing. If the fracture is displaced, meaning the bone fragments do not align, an operation to pin or plate the fracture may be considered. Second, third, and fourth metatarsal fractures tend to heal nicely with an ace wrap for support and weight bearing as tolerated. Stress fractures usually involve the second and third metatarsals, and are called "March fractures." March fractures were initially recognized in military recruits who were required to quickly increase the amount they walked. Splints , casts, or walking boots may be considered for pain control. Fifth metatarsal fractures are of two types. Avulsion fracture at the very base of the bone are treated in the same way as the other metatarsal fractures. Jones fractures of the fifth metatarsal shaft have a non-healing (non-union) rate of up to 50% and often require surgery to fix the fracture. Lisfranc fracture dislocation injuries require surgery for repair. The treatment of talus fractures depends upon where in the bone the fracture occurs. The top of the talus is dome-shaped and is part of the ankle joint, fitting into the base of the tibia or shin bone. This fracture may not be easily identified and sometimes can be mistaken for a non-healing ankle sprain. The treatment is rest and avoidance of weight bearing. Talar neck fractures often have difficulty healing because of poor blood supply. Surgery may be required if the bone is displaced, otherwise no weight bearing in a cast for 2-3 months may be required. A Shepherd fracture involves the posterior, or back part, of the talus and is seen in athletes who dance or kick. The treatment is immobilization in a cast. Lateral process fractures of the talus are becoming more common with increasing numbers of snowboarding injuries. Treatment includes no weight bearing in a cast. Calcaneus fractures require significant force to occur and are associated with a marked amount of swelling and pain. An orthopedic surgeon or podiatrist is often consulted emergently to decide whether surgery is needed to stabilize the fracture. CT scan may be needed to assess the extent of the fracture, and whether the fracture line enters the joint. The health-care professional also may look for associated injuries of the ankle, knee, hip, and lumbar spine. Immobilization of the fractured foot will help with pain control. Anti-inflammatory drugs like ibuprofen (Advil, Motrin) can be helpful with over-the-counter pain control by decreasing inflammation in the area. Narcotic pain medication may also be prescribed if needed. Rest, ice, and elevation will help limit swelling and decrease pain. As with any injury, complications may occur. Broken bones may fail to heal, causing a non-union that may require surgery to repair. If the fracture line enters a joint surface, arthritis may develop, even if the joint surface has been aligned by surgery. Open fractures may be complicated by infection and damage to underlying structures like tendons, arteries, and nerves. Though it is uncommon, crush injuries to the foot may cause significant swelling in the tight spaces of the foot, leading to compartment syndrome. Should the pressure in one of these compartments rise above the patient's blood pressure, decreasing blood flow to the area of foot beyond the injury. This is a surgical emergency and fasciotomies, incisions into the foot compartments, are performed to allow space for the swelling to occur, relieve the pressure, and restore blood supply to the foot. The foot is placed under considerable stress on a daily basis, absorbing the pounding of walking, running, and jumping. Poorly-constructed and -cushioned shoes and obesity help contribute to stress fractures and general instability of the foot. High-impact sports that include twisting and direct blows to the feet increase the risk of fracture. Appropriate protective equipment will help decrease the risk of injury. Certain occupations increase the risk of foot injury. These include the construction trades in which weights may be dropped on a foot, or falls from height may occur. People with osteoporosis or peripheral neuropathy may have increased risk of foot injury. For these people, it is important to decrease the clutter around the house to prevent injury from falling. It is also helpful to limit the number of throw rugs in a home that can cause a person to trip and fall. Most of the bones in the foot will eventually heal with rest, but some fractures may need surgery to repair. Often, it is the mechanism of injury associated with the intensity of pain that makes the patient seek care. It is appropriate to seek medical care if the patient cannot walk normally without a limp. Medical care should be accessed immediately if an injury to the foot also includes a laceration. The term "open fracture", previously named "compound fracture," describes a broken bone that is associated with a break in the skin. Open fractures pose a significant risk for major infection of the bone. Boutis, K. "Foot fractures (other than metatarsal or phalangeal) in children. UpToDate. March 2019. <http://www.uptodate.com/contents/foot-fractures-other-than-metatarsal-or-phalangeal-in-children>. Boutis, K. "Metatarsal and toe fractures in children." UpToDate. March 2019. <http://www.uptodate.com/contents/metatarsal-and-toe-fractures-in-children>. Gravlee, J.R., et al. "Toe fractures in adults." UpToDate. March 2019. <http://www.uptodate.com/contents/toe-fractures-in-adults>.